With Andy Kidd and John Pantry producing and an Abba-style line-up it sounds promising. Looking forward to it. As soon as my six year old son saw the album cover he said to me, “is that supposed to be God’s hand holding the world ?”. Astute lad ! 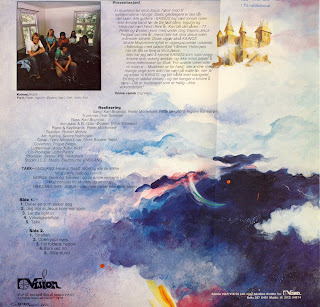 But that’s one of those things about Scandinavian christian albums that so often surprizes me. They are paradoxically so simple or so progressive but impressively often both. I mean, it’s such an obvious picture. But the music contained within is quite deceptive because here is a band that could play. 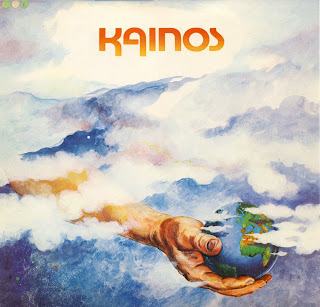 They are not beyond being poppy in that trite Euro-pop way that people in the UK have long had a problem taking seriously, but Kainos successfully fuse that with a serious and neo-progressive side which makes altogether for some tasty stuff here. It didn’t necessarilly seem that way initially but further listens bring out what wasn’t straight away apparent. It’s possibly somewhat irritating to people from Norway, Sweden and Denmark to be lumped together as ‘Scandinavians’ (rather like people from Scotland, Wales, England being called ‘British’) as there are definite national characteristics. I do find a similarity in much of the rock, folk, jazz and pop music that I’ve heard from those places though – and I would throw Holland in there too. I guess I just find them more open to fusions and what was going on musically elsewhere. Or at least they were back in the late 60s /70s. Good album.